Alicia Vikander’s New Movies for 2017: Will the Academy Award Winner Grace us with New Movies in 2017? Alicia Vikander has a lot on her plate right now, and apart from presenting awards at the Oscars on February 26, she also has a few new movies in the works. Take a look at Alicia Vikander’s new movies for 2017. On February 1, E!News reported that the producers of this year’s Oscars, Jennifer Todd and Michael De Luca, revealed the first set of presenters for the awards. As usual, the winners from last year will present the awards for their opposite gender counterparts this year. So, we can expect to see Brie Larson, Leonardo DiCaprio, Alicia Vikander, and Mark Rylance on stage at the Oscars once more. We cannot wait for the Oscars this year, and we are also excited for Alicia Vikander’s new movies for 2017. She has a few films lined up this year, but before we get into Alicia Vikander’s upcoming movies, let’s take you back to where she began. Alicia Vikander was always fascinated with the world of acting. At the age of seven, she starred in a production at The Göteborg Opera, and performed there for more than three years. She appeared in musicals, including The Sound of Music and Les Misérables. Vikander is not just a brilliant actor but she is also a trained ballet dancer. At the age of 15, she moved from her hometown to train in Stockholm. During this time, she was able to travel across the globe for summer courses. Vikander was so in love with the world of acting that she nearly left school at 16 to concentrate on her acting career. Alicia Vikander’s credits include: Anna Karenina (2012), Ex Machina (2015), The Man from U.N.C.L.E. (2015), The Danish Girl (2015), Jason Bourne (2016), and The Light Between Oceans (2016). She is currently dating Michael Fassbender, whom she met on the set of The Light Between Oceans. The pair started dating in 2014 and are still going strong. 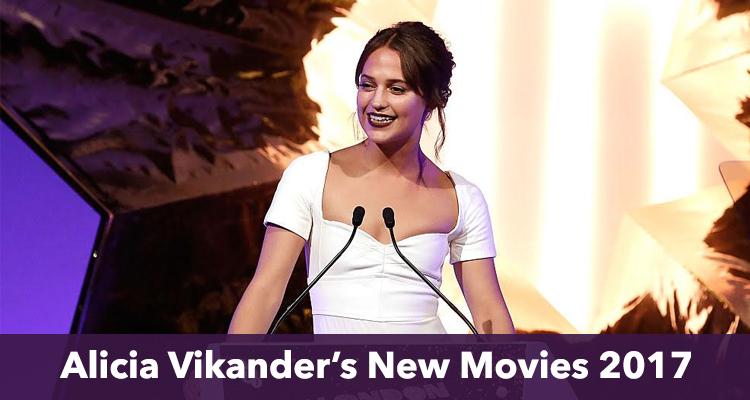 Fresh off her Academy Award win for Best Performance by an Actress in a Supporting Role in The Danish Girl, Vikander is preparing for her upcoming movies this year. Below are Alicia Vikander’s new movies releasing in 2017. The plot is set in the early 17th Century in the Netherlands during the Tulip Mania, a period during the Dutch Golden Age, where the prices of tulip bulbs were very high before suddenly dropping. Jan Van Loos (Dane DeHaan) is an artist who falls for a married woman named Sophia (Alicia Vikander) when he is commissioned to paint her portrait by her husband, Cornelis Sandvoort (Christoph Waltz). In order to secure a future together, the two lovers invest in the risky tulip market. The film was originally set to release on July 15, 2016, but was pushed to February 24, 2017 because of a reported re-editing, as producer Harvey Weinstein was unhappy with the final cut. Directed by Justin Chadwick, Tulip Fever is adapted from a screenplay written by Sir Tom Stoppard, which was adapted from a novel written by Deborah Moggach. The movie stars Judi Dench, Cara Delevingne, Alicia Vikander, Christoph Waltz, Zach Galifianaksis, Jack O’Connell and Matthew Morrison. The film will hit theaters on February 24, 2017. This highly anticipated romantic thriller is produced by Cameron Lamb and directed by Wim Wenders. The movie is based on the novel of the same name written by J.M. Ledgard, and the film was written by Erin Dignam. It stars Alicia Vikander, James McAvoy, Celyn Jones, Alex Hafner, and Darian Martin. Submergence follows James Moore (James McAvoy), an Englishman being held captive by Jihadist fighters in a room with no windows on the Eastern Coast of Africa. Meanwhile, in the Greenland Sea, thousands of miles away from James, Danielle Flinders (Alicia Vikander) prepares herself to dive in the submersive ocean floor. In their separate states of aloneness, both think back to the previous Christmas when they met on a beach in France. The release date and trailer for the movie has not been released, but the film is slated to be in theaters this year. This film is a story about two sisters in conflict, who travel through Europe towards a mystery destination. It is written and directed by Lisa Langseth and stars Alicia Vikander, Eva Green, Mark Stanley, Steffen Jung, Charlotte Rampling and Eveline Hall. This is the third time Alicia Vikander and Lisa Langseth are working together, the first two being for the films Pure (2010) and Hotel (2013).